If you are interested in Parachuting Teddy Bears this is one sure fire way of dropping them with confidence. There are many different ways to parachute teddy bears, but this is a very simple effective way of getting the job done. Before we get started with the instructions please remember that you may have to assemble and dissasemble the dropper as you go through the various steps. Step E) through G) will require you to play with the coat hanger and spring till you get a nice smooth action. Do no tighten anything down till you are truly happy with the release mechanism action. The mechanism should be tight enough to hold your bear in place. It also has to be loose enough to release your bear when you pull the trip line. A) Start with a 8 inch long PVC tube. As they come in long lengths you may want to make more than one at the same time. 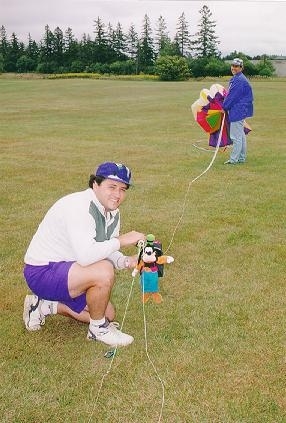 You can always give the spare to a good kiting friend. B) Using a Dremel or hacksaw cut a 1/2 inch long by 1 inch wide hole 2 inches from the front. B) is the release point that the bear will be attached to. D) Select a drill bit that is just a bit smaller than the screws that you will be using. Using your drill make two holes in the PVC tube One 1/2 inch from the back and the other 1/2 inch from the front now insert your screws by hand and lossely fasten you bolts in place.The screw should not slide in easily. Instead you should have to use a little elbow grease to screw it into place. The advantage of a snug fitting screw is that it will be less likely that it will loosen up over time. Now is a good time to test the dropper. Use something simple like you key chain. Pull the release open at point I) and insert the key chain into the opening at point B)now slowly let the coat hanger go through the key chain until it is securley locked in place. Hold the tube out and pull the coathanger at point I). If the key ring drops to the ground and your dropper is still in one piece you are truly amazing! Insert your fly line through both eyelets. Make sure the release(I)) is pointing away from your kite. Slide the mechanism until it is about 30 feet away from the kite. Lock the release mechanism into place by simply tying a split ring onto your line between the two eyelets at point J). Use exactly the same method you would use to add your sky laundry to your line Your bear should have some kind of loop (example key ring/ split ring) attached to his harness. The loop goes into the opening at point B). Attach you second trip line to point I) and you are ready to go! If you still have any questions please write me. I will be glad to help.